Find My Workspace lists over 95% of the serviced offices market in Prenzlauer. Simply click Request Quote to check pricing for one office, or Add to Basket for multiple offices. 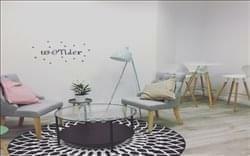 This coworking space in the district of Prenzlauer Berg in the heart of Berlin, is the first coworking space in Berlin exclusively for women. The centre offers a range of fixed and flexible workplaces and team offices, designed to suit your business needs and give you the opportunity to work flexible. Team offices can be booked for mixed teams of course, and business address and meeting rooms are bookable for women and men. There are plenty of unique women’s networking opportunities where you can meet likeminded women and grow together. An on-site library holds plenty of books on the topic of women, women in business and start-ups. Meeting rooms are readily available for your use, whether you’d like to plan a 1-to-1 meeting or manage your own networking event. Free beverages will also keep you energised throughout the day, with filter coffee, fresh fruit and filtered water. The centre also benefits from a kids’ corner, a changing table, WIFI, printing facilities and much more. To obtain information for your selected Prenzlauer Serviced Offices, please tick the "Add to basket" box for each office you prefer and complete the form below. We will then send a detailed report via email.